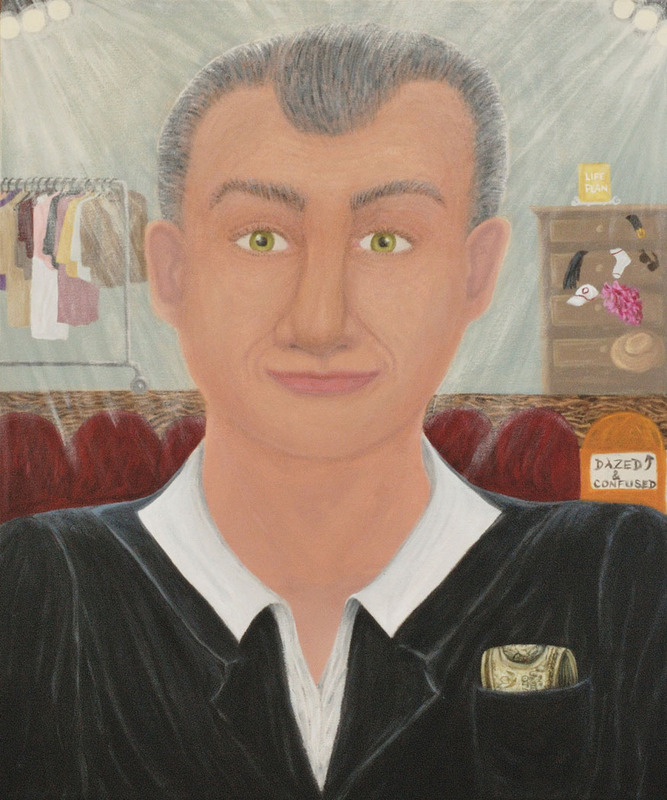 I’m proud to present the portrait of my guide, Jasper, as painted by my friend, Stephanie Reigle. The image of Jasper is exactly as I’ve seen him in my head for the last few years. Remarkably, I had no input into what Stephanie was painting. It was a result of her interacting with his energy, and suffering some of the same verbal abuse that I receive. In addition to his image, he had her add details like the spotlights at the top, because he loves to be the star, parts of his extensive wardrobe and accessories collection, the 7 chairs that he and I sit in when we have staff meetings with my other guides, and even my money that he keeps in his shirt pocket. You may notice that one of the chairs is labelled, “dazed and confused”. Of course, that’s my seat, because it describes my spiritual condition most of the time. At least it’s an upgrade from the “dolt” and “lunkhead” labels he used to pin on me. As far as I know, and remember, I’m dazed and confused, this is the first time an artist has been able to reproduce an image of someone’s guide with such accuracy and realism. Jasper loves to be the center of attention, so being first in that category suits him just fine! If you want to find out more about my adventures in spirituality with Jasper, you can buy all of my books on this website, and read my blogs, also on this website. I’m posting a link to Stephanie’s website below, so if you are interested in her intuitive artwork, please check it out.